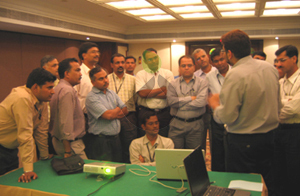 UX courses scheduled in Pune, Mumbai, Bangalore, Hyderabad, Delhi and Chennai. Save upto Rs. 2000 by registering early. A three-day advanced course for designers and developers. Learn Usability Engineering, Information Architecture and Interaction Design Principles in day-to-day User Interface Design for Web, Enterprise and Mobile. Does your organization need knowledge transfer about User Experience Design? Contact us to find out what kind of training best fit the needs of your organization. ‹ A still from DI's design workshop for industrial practitioners. Design Director Atul N Joshi demonstrates User Experience Design techniques.